All prepared for the event, except for the failed proper adhesion of my lashes on my right eye. If you wanna drive into Resorts World, be prepared that the carpark charges are scary...$6 for 1st hr, and subsequent hours cost $2/hr. One thing good is it absorbs Sentosa Island admission charges. And it's capped at a maximum of S$20 for 24 hours. Good news is during weekday-lunch hours from between 12.00pm and 2.00pm, RWS is introducing a special concession rate of S$1 for the first hour of parking. Walking towards the Convention Centre and feeling super swakoo coz I was like "WAH!!!! Very big leh!!! Very nice leh!!! WAH SHAVY(my manager)! See the lights!!!" Trying to look seh despite my excitement. 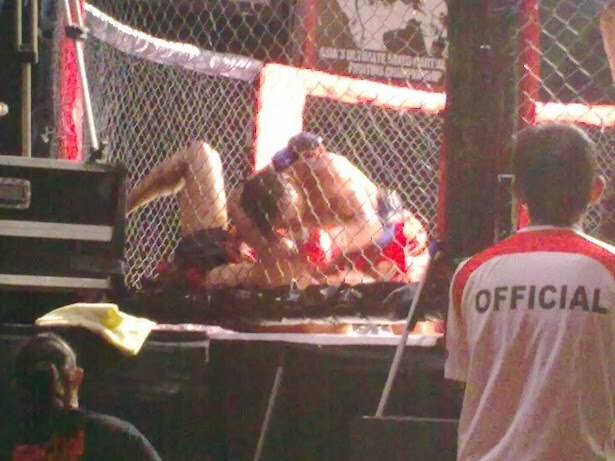 Anyway, MMA stands for Mixed Martial Arts. 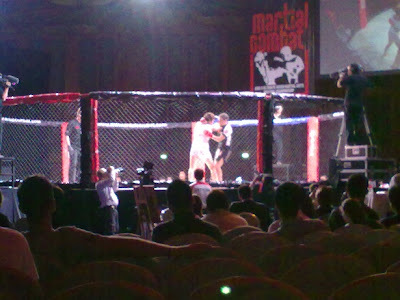 And this event I was attending is called Martial Combat. MMA is a full contact combat sport featuring an array of fighting techniques and skills from a variety of traditional and modern martial arts. Meaning to say, there is no fixed style to use. You can combine Judo, Wushu and Karate, or Muay Thai, Brazilian Jiu-Jitsu with Boxing. Whatever works, you use it in your favour. Cool huh? I was watching “The Legend is Born: Ip Man" and the son of the original Wing Chun master injected some life into Wing Chun by introducing high kicks and several techniques not usually used. There was some conflict that the proper original Wing Chun shouldn't have high kicks, but it did make the fighting style more powerful, so the new techniques were accepted later on. Of course you can't do things like biting, hair pulling, clawing the flesh, spitting at ur opponent or grabbing their groins. Be civil here, shall we? The whole list is here, under FOULS. MMA has been around since the early 1900s, but really only got more popular in recent years. 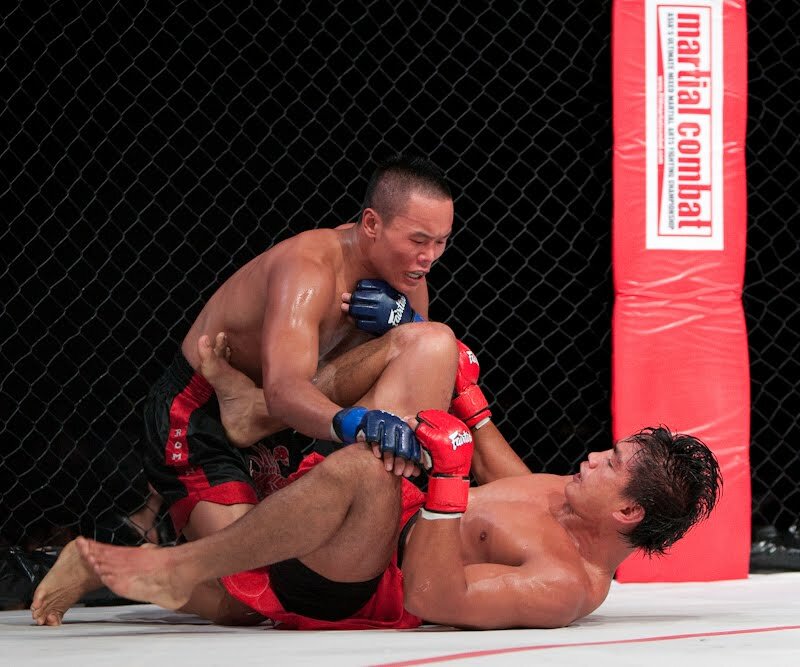 In Singapore, not much is known about the sport, though I've seen a school teaching MMA in POMO called Evolve. I heard walk-in trial sessions are available at $50 per session if you wannd find out whether this is your thing. Asia's ESPN Star Sports, in partnership with RWS, launched MARTIAL COMBAT – Asia’s Ultimate Mixed Martial Arts Fight Championship in 2010, in May this year. For 2 days a month from May till October, you'll get to watch some of the World's toughest fighters, right here in Singapore!!! 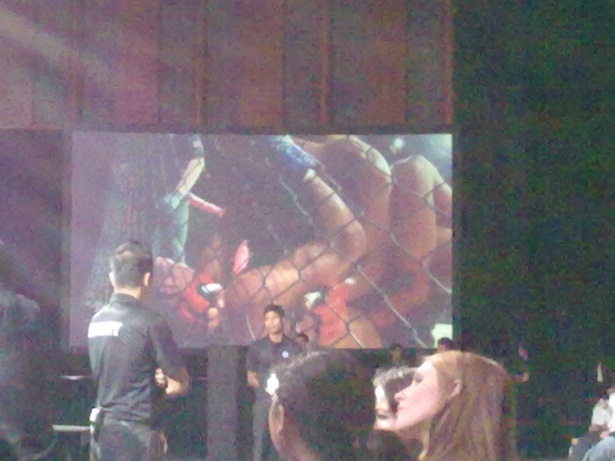 I've only gotten to watch actual ring fights in movies like Ip Man, so this was something really exciting for me! 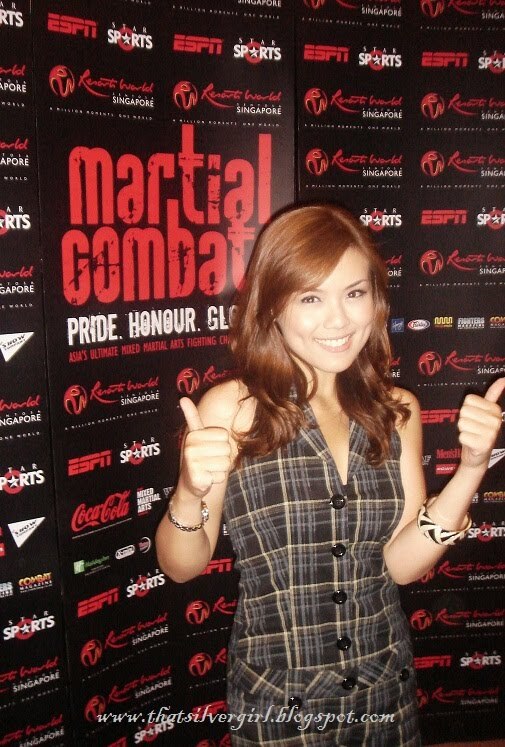 The MARTIAL COMBAT will feature a grand total of twelve events comprising 60 action-packed fights per year, featuring some of the most popular and celebrated Asian fighters and many ranked fighters from around the world. It will receive an unprecedented amount of television coverage from ESS in excess of 60 hours, making it the largest MMA broadcast in Asia. This will be the first-ever MMA event till date to receive television coverage in 24 different countries in Asia, extensive online support through www.espnstar.com and mobile initiatives through mobileESPN. 310 million viewers of STAR Sports will be watching this event!!! Great way to boost our tourism and the integrated resorts~! AND AND AND!!!!!! If the presentation of the belt gets broadcast, 310 million viewers will see me leh!!!! How many viewers do we have watching our local channels? 4million? If EVERYONE decides to watch TV la. Which I doubt will happen. 310 million viewers across 24 countries!!!!! See the cage in the middle? That's where the fighters will battle it out!!! Honestly, I wouldn't want to be that guy in green shorts. THE most action-packed fight for the night. Though this wasn't the main event which would be the Superfight later on, I gotta tell you, the women's fight was fiercer than any of the men's fights I saw that night. Now for the main event - The Superfight Championship Belt Showdown!!! Between Eduard Folayang (top) from Baguio, Phillipines, and Bao She Ri Gu Leng (bottom) from Inner Mongolia, China. I think Eduard's kinda good-looking. 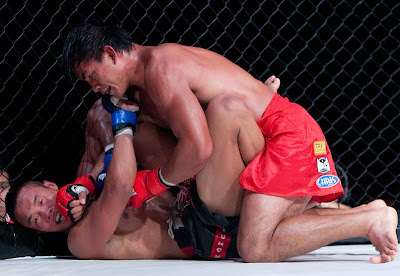 Eduard is the current MMA Champion of the Philippines and a multiple SEA Games Wushu gold medalist. 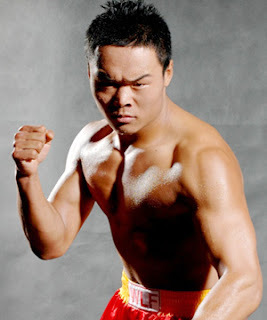 Bao She holds the Champion title for the 75kg WulingFeng in Sanda and has fought in ALL of China's MMA promotions. In his career, he has remained undefeated. Will he keep that record tonight? Waiting for the final match which determines the winner for the night! How about watching it live? Next fights are on the 18th and 19th of August! There will be fights in September and October too! Grab your tickets from Sistic now!! !